Conch Bar Beach and Village, Middle Caicos. The rugged coastline fronting the small village of Conch Bar on Middle Caicos is an impressive place to explore. When there’s an ocean swell, large waves can be seen breaking close off the beach. Looking east over Conch Bar Beach from Big Hill. 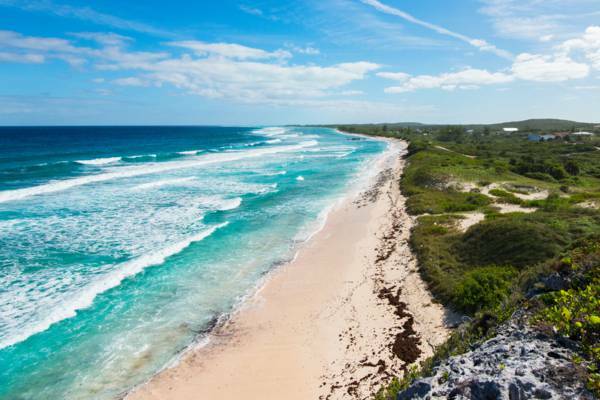 Fronting the tiny village of Conch Bar, this beach is one of the few in the country that is located close to the subterranean underwater wall of the Caicos Islands plateau. About 2000 feet (610 metres) off the beach, the ocean depth drops abruptly from about 50 feet (15 metres) down into the thousands. Due to this geology, Conch Bar Beach and the adjacent Mudjin Harbour Beach emanate more of a rugged feel than the other beaches in the country. The attraction of the Conch Bar Caves derives it's name from this settlement. The rugged coast at Conch Bar. The swimming and snorkelling at Conch Bar Beach depend highly on the surf conditions. When there’s a swell, neither is feasible. However, when conditions are calm, snorkelling is excellent. The small bluff on the coast (Big Hill) to the west of the village offers spectacular 360 degree views and is a great place to watch the surf. Due to the abrupt change in ocean depth, there’s typically a break to be found off the beach. Although usually too messy for surfing, when the conditions are right, this spot can be quite nice. 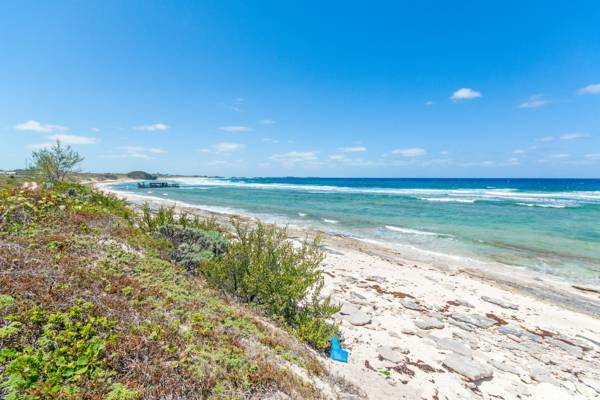 The best surfing and stand up paddling break is found off the large hill to the west of the settlement and about half way between Mudjin Harbour and Conch Bar Beach. It’s very easy to access Conch Bar Beach as a small coastal road follows the ground above the beach. Simply stop at whatever spots appeals to you. The small parking area at Daniel’s Café is the most popular access spot. The main parking area and access for Conch Bar Beach.